In the first long-distance broadcast of its kind, the BBC has successfully filmed a Charlatans gig in the UK and beamed it to Japan in Super Hi-Vision. NHK's Super Hi-Vision technology makes Full HD look blurry. It offers a picture quality that is 16x better than Full HD (a whopping 7680-by-4320 pixels), which means an audience in Tokyo got to see Tim Burgess' face in scary clarity. This isn't the first time the BBC has used this technology. It has previous shown off a live Super Hi-Vision feed at IBC 2008 where it broadcast from the UK to Amsterdam, but this is the first intercontinental broadcast. Technological improvements have meant that this feed has been stretched to reach all the way to Tokyo. This is no mean feat considering the signal of the broadcast has to be transmitted at 24Gbps and was shown on a prototype 103-inch Panasonic plasma television in the UK. 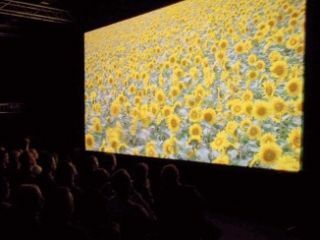 The performance was shown on a larger screen in Tokyo. Takahiro Izumoto, a senior engineer for NHK, explained about the broadcast: "This is the experiment showing we can broadcast from the UK to Japan. "In a year, we'll have a vision mixer and the superimposer [a means to add subtitles], so it will be easy to do a whole production as live coverage." NHK is hoping that regular broadcasts will be done in Super Hi-Vision by 2020, while Roger Mosey, director of the BBC's 2012 Olympics coverage, would like some of the 2012 Olympics shown on screens in Super Hi-Vision.